If you’re planning a street party or having the family over for the weekend this summer, you may be looking for a little culinary inspiration – the type that requires minimum stress and perspiration. If you’re prepping food for a variety of tastes and palates, catering for everyone can be a headache. But no need to stress, here are 15 party foods to take the tension out of entertaining, providing a perfect mix of culinary delights and suitable for all dietary types. A definite party stalwart, sausage rolls rock with a sweet kick of apple. Easy enough to make from number of online recipes, you’ll need find yourself some excellent quality ready-rolled puffed pastry, lean pork mince, egg and apples. Check out this recipe for a simple but delicious party snack. Grilled flank steak is ideal for these mini burgers, cut into squares approximately 3cm wide. Cut the bruschetta into 2cm-wide slices and add these to the top and bottom to make a sandwich. Then pierce the burger with the stick securing it together. Best served soon after cooking, these burgers are delicious paired with with McCain Home Chips crinkle cut. For extra flavour, add a slice of tomato or a dash of hollandaise sauce. Not just for Christmas, turkey also makes a great (and low-fat) party ingredient. Mix turkey mince with mixed herbs and cranberries and roll into balls. Grill or heat in a pan with oil until cooked through and serve. Here’s a popular recipe. What would a party be without prawns? Choose cooked prawns and load generously with a cocktail sauce, adding plenty of flavour. Our favourite? It has to be Marie Rose. Always a hit, and a light and easy party snack, the California roll is one of the most popular sushi dishes. There are plenty of recipes online, but you’ll need lemon, avocado, nori, sushi rice, toasted sesame seeds, cucumber, crab sticks and pickled ginger. The most versatile of all party foods, you can buy hummus from most UK supermarket chiller cabinets, serve with a range of salad sticks: cucumber, carrot and celery. Hummus is also great with additional flavour – try turmeric and pepper as extra ingredients to give your hummus a kick. 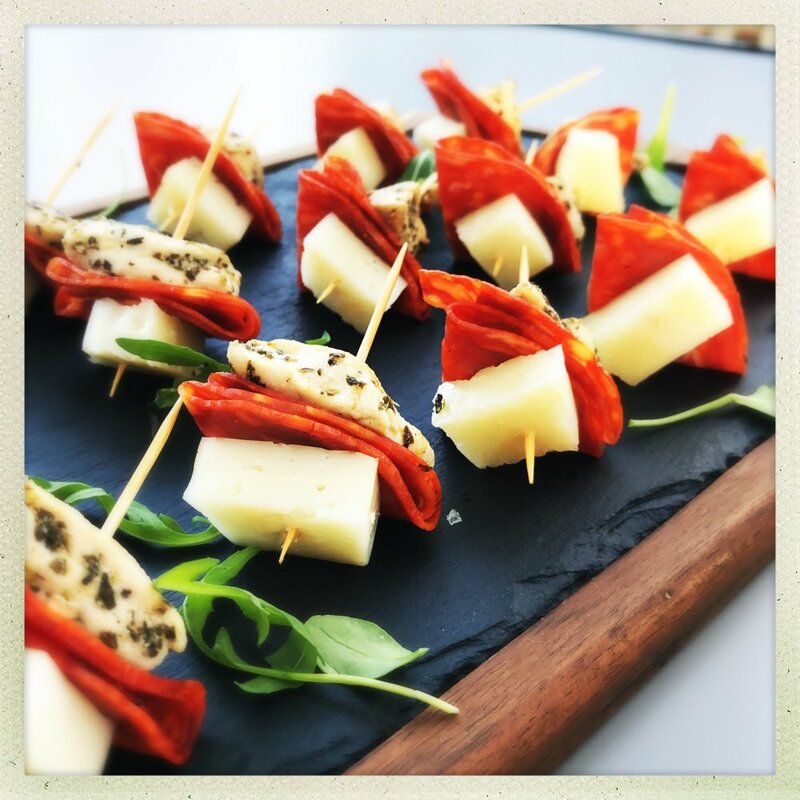 The perfect accompaniment to the party platter, sun-dried tomatoes are a simple but tasty party pleaser. Perfect on their own or with any of the other foods, Chinese spring rolls make great party food. No need to make from scratch as they are readily available to buy, and are quick and easy to heat up or serve cold. Be sure to have an array of sauces on hand – peanut dipping sauce or hoisin sauce is ideal. Make your guests an opulent olive skewer with a mix of green, brown and black olives. Add in a few red, green and yellow peppers to brighten up. Spanish-inspired meatballs are guaranteed to add a little spice to your party menu. Spicy chorizo and paprika work a treat. Incredibly versatile snack to accompany the various dips and sauces you have, be sure to have a mix of plain and more spicy nachos on hand for guests. A simple but delicious party food great for vegans and vegetarians alike, make a couple of slits in your slices of aubergines and add garlic inside. Sprinkle on a little olive oil for oven baking and you’ll have a healthy and flavoursome dish. An Italian-inspired dish, you’ll require fresh large cupped mushrooms, pre-heat on the hob using olive oil and garlic, then add the ricotta cheese to the cups and bake. A delicious treat for mushroom and cheese lovers alike. Choose a mix of melons: watermelon, cantaloupe and honeydew and slice these into cubes or use a small fruit scoop to create melon balls and serve in small plastic ice-cream pots as a fruit salad. Light but refreshing and tasty. Add a few grapes or ice cream to serve. A light but delicious and simple-to-prepare dish, wash your pears and cut into halves, sprinkle with cinnamon and bake. When ready, serve with dark-chocolate sauce. Light but opulent, this simple recipe is ideal for those with a sweet tooth and is also vegetarian. Disclosure – post in collaboration with McCain – for full details of my disclosure policy please read here.